Tyler Jackson threw a pair of touchdown passes to Broc Pickens and Daniel Kennedy, but Perry scored the go-ahead score with 16.7 seconds remaining to take the game 16-14. Austen Black also recovered a fumble and Clayton Elder & Pickens had interceptions for Louisville. Tyler Jackson ran for a pair of touchdowns and also threw touchdown passes to Clayton Elder and Daniel Kennedy as the Leopards JV shutout the Quakers 34-0. Gage Hartman also had a rushing touchdown for 2-1 Louisville. Tyler Jackson threw 5 touchdown passes including 3 to Clayton Elder as the Louisville JV ripped Hoover 38-8. Daniel Kennedy also caught a touchdown pass and threw another on a trick play to Broc Pickens had scored through the air twice. 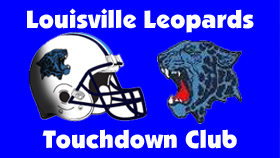 The Leopards scored on their first two offensive possessions as Max Hartline and Colton Jones ran in scores. On defense, Jimmy Ashcraft recovered a fumble and Hartline also had an interception. Colton Jones threw 4 touchdown passes as the Leopards rolled up 42 points in the first half against the Vikings. Davis Burick also caught a pair of touchdowns. Davis Burick scored on a touchdown run & a pick six and Colton Jones threw 2 touchdown passes as the Leopards rolled past the Aviators 34-8. The Freshman are now 4-0.